Medical sales reps: Are your customers “cheating” on You? This week, the Medical Sales Guru Podcast looks at a heart-breaker: That pain you experience when you learn your customers are flirting…or cheating with the competition. It’s going to happen, and you’re not going to like it. Deal with it! That’s what this episode is about – a light-hearted look at your need to get real with this part of the business. Medical sales is tough. Why go it alone. Get training and ongoing support on your journey. Click Here for More Info. Medical sales representatives often ask me whether the role of medical sales reps will change, or even if medical sales reps will be around in the future. Take a look with me in the crystal ball as I share my thoughts as to what the future holds for the medical sales representatives of tomorrow. Medical sales representatives are always searching for ways to sell more in their territories. The reality though, is that 95% or more of all medical sales reps just keep doing the same thing over and over. Yet, there is a very simple (although not necessarily easy) way to instantly create more engagement with doctors, dentists, surgeons and other healthcare professionals that will lead to more sales. What is it? It’s about changing the story that you tell when you’re selling. That’s what this podcast episode is all about. Listen now to learn how you can dominate the medical sales in your territory with a simple shift in the way you sell. CLICK HERE to Register for FREE webinar masterclass on this topic taking place this Wednesday. Medical sales reps often approach difficult customers with anticipation. Unfortunately, they often anticipate NOT getting the sale! It makes little sense to make a sales call that you expect to fail. Why does this happen? Often, it’s because reps don’t believe that the product measures up to what the customer is using now or their own ability to convert the customer. Listen to this short podcast and add a large measure of confidence to your sales calls…confidence that can make all the difference in the world. 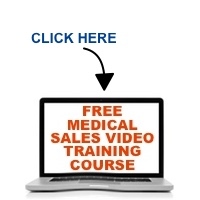 Learn How Medical Sales Academy Can Help You Sell More and Retain Business Without Making Costly Mistakes. Medical sales representatives often give the sales effort everything they’ve got, only to discover they’re talking to the wrong person. What? Chances are, you no longer sell in a world where clinical personnel are the only decision makers. How do you identify the others and avoid finding yourself in the trap of selling to the wrong people? This short podcast will answer this important question. Better to find out earlier than later, right? Since this knowledge is so widespread, why do so many medical sales representatives do it wrong? Medical sales speaker Mace Horoff discusses the keys to closing in this short podcast. CLICK to learn how to optimize your medical sales performance in just 10 minutes a day.